This Excel Template is designed to help assess coverage of team members’ availability during a month. As a Team leader or a Manager of a team, it is important to know the staff coverage available every day, especially during the holiday season. This Excel template can be used every month to ensure that you are aware of exact coverage and plan accordingly. It can handle up to 20 employees. This is used to identify understaffed (low coverage) days. Understaffed day is a company working day where the ‘# of employees at work is less than the Number of Employees needed daily’. Select the weekend days of your company. These days will not be counted as working days. Enter up to 7 holidays. These days will not be counted as working days. Enter Employee Name and the planned vacation dates. If an employee plans to take two periods of vacation (Oct 2 to Oct 7 and then Oct 20 to Oct 24), enter that as two rows. If an Employee does not plan to take any vacation, then enter just the Employee name in a row and leave the date columns blank. It is important that all employees appear at least once in the table. Once the inputs are provided, the template automatically calculates the summary metrics. In addition it also shows the number of employees at work for each of the 31 days. Holidays and Weekends will not display any numbers. Red bars indicate understaffed days (days where number of employees working is less than the number of employees needed). The template also has a vacation calendar that visually shows the vacation days on a calendar. Let’s take a closer look at the top of the calendar first. Each employee is listed on the left. Holidays are shown in Orange and Weekends are also highlighted in gray. 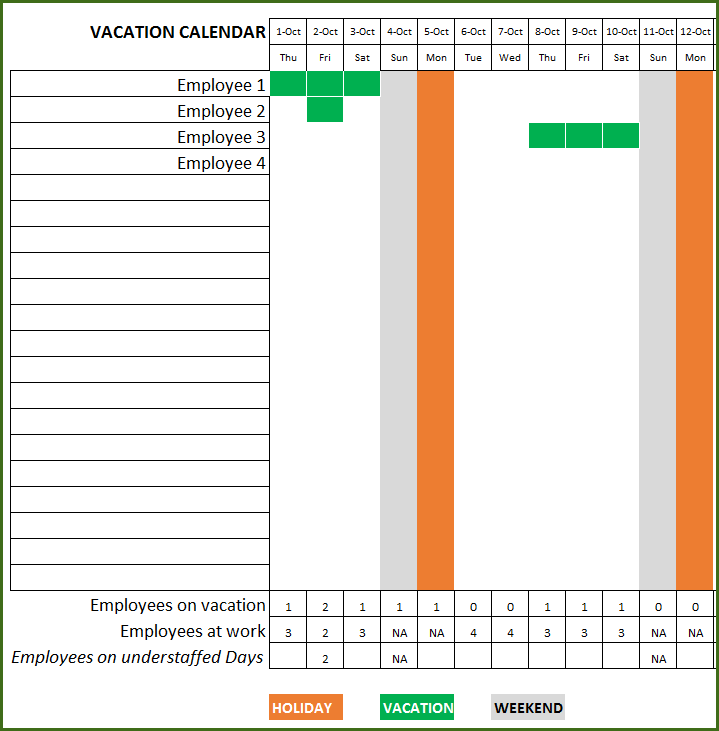 Employee’s vacations are shown in Green fill. The calendar displays for 31 days and 20 employees at a time. Here’s a look at the entire calendar (vertically). At the bottom of the calendar, we can see the legend and daily summary metrics. Number of Employees on Vacation and Number of Employees at Work for each day are summarized. You can also easily print this for use within your office. Or you can export to PDF and share by email. If you are looking for a longer planning period, with support for more employees and unlimited holidays, check out the Team Vacation Planner template. If you are looking for capacity planning in terms of hours of availability and have varying demand, please visit Resource Capacity Planner Excel Template. I would love to get your feedback on this template. Do you find this useful? What features should be added to this template? Please share in the comments below. Hi Thank you for your leave tracker excel template. Will you please tell how to include more employees into this excel. As it just allow 20 employees I want to put more 10 employees into this sheet how would we do that. Please extended the table down. Also, ensure that you move total rows before extending the table. I’m Avijit Bhakat. I want to know that how to creat employer daily production report excel in vba? Plz help me. This is fantastic and easy to use. Thank you, it is very useful. Do you have a 1 year version of this? Thank you for the feedback. Glad to hear. Please see https://indzara.com/product/team-vacation-planner-excel-template/ which supports 1 year. Please see Team Vacation Planner template https://indzara.com/product/team-vacation-planner-excel-template/ that supports more employees. The Leave tracker https://indzara.com/2016/11/employee-leave-vacation-tracker/ supports 5 leave types. You can see in that article how colors can be changed by editing conditional formatting rules.